“I’ll have some guitar strings please”. 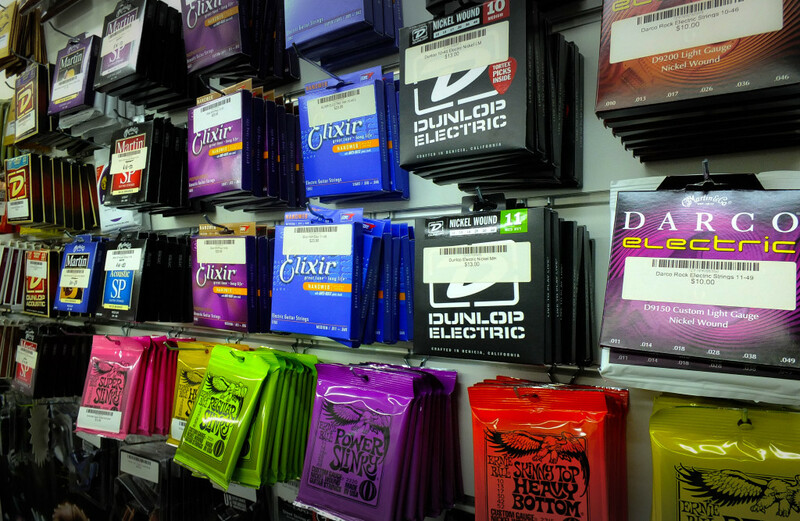 There is a lot to learn about guitar strings. Acoustic or electric? Steel string or nylon string? What gauge? Which brand? Phosphor Bronze or vintage bronze? If you’re buying on-line you’ll need to know what you’re after or you’ll get the wrong ones. If you’re coming into the shop, having some idea of what you need will save you some time for sure! This includes ‘Acoustic/Electric’ guitars, or acoustic guitars with a built in pickup. These guitars are often incorrectly referred to as ‘semi-acoustic’, but actually that’s something different again. An acoustic guitar with a pickup is simply an acoustic guitar, with a pickup, and takes the same strings as a normal acoustic guitar. So is it nylon or steel? This is really important. Putting steel strings on a ‘classical’ nylon string guitar is a crime almost as bad as putting diesel in your petrol powered car. 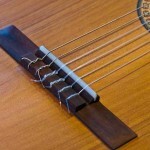 Steel strings put significant tension on your guitar that classical guitars just aren’t built to handle. Putting nylon on a steel string isn’t such a crime, but it’s very impractical. The guitar would need some adjustments, and the strings will feel very tight. Nylon string sets come in various ‘tensions’, but medium or high tension is fine for most people. They also come with or without ‘ball ends’. Traditionally nylon strings are tied around the bridge of the guitar. Ball ends make it much easier to put the strings on, but don’t look quite as classy. Perhaps your guitar has 3 steel and 3 nylon? No it doesn’t! Those ‘steel’ stings aren’t steel (at least, they shouldn’t be! ), they’re silver-wound with nylon cores. The wound strings in a nylon set are usually silver colored, rather than bronze (although they’re sometimes gold, which is confusing, because those gold wound ‘nylon’ strings really do look like steel strings!) If you unwind some of that silver on a typical wound classical guitar string you’ll see that the core is ‘fluffy’ and frays, rather than being a steel wire like on a steel string guitar. This last picture shows gold and black nylon strings with ball ends. Unusual colouring, but they’re still nylon strings. This is a little more complicated. You have more options. 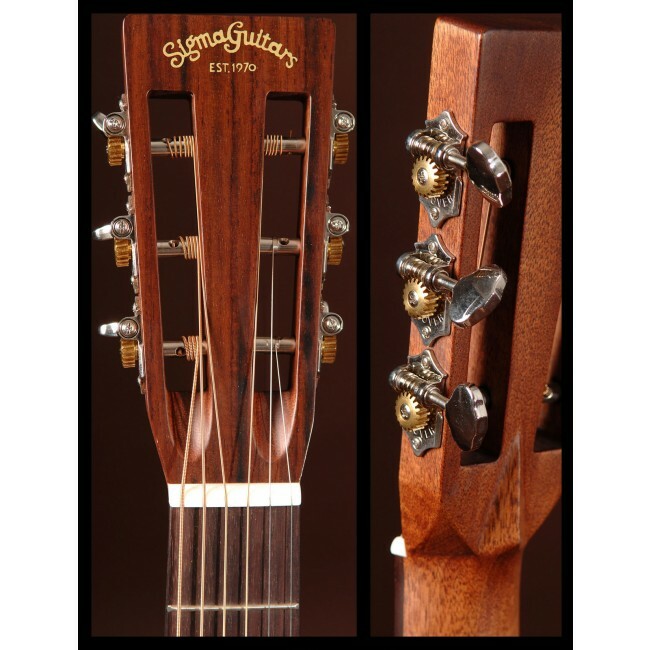 Steel string acoustic strings come in various gauge’s, which is the thickness of the string. Lighter (thinner) strings are easier on your fingers, heavier (thicker) strings are louder and arguably have a better tone. Or at least a tone with more body to it. Some people actually prefer the sweeter ‘prettier’ sound of thinner strings. The general rule of thumb regarding gauges is IGNORE THE NAMES. What I mean is “Light” or “Medium” – these names are really misleading. They come from a time when guitar strings were generally thicker than they are today. ‘Mediums’ are usually 13-56 gauge actually the heaviest acoustic strings we carry. They’re too heavy for most players. In reality ‘Light’ strings, or 12 gauge (12-53 or 12-54), are the most ‘average’. These are the strings we put on the shop guitars. If you’re after something a little easier on your fingers, try ’11’s’ (usually 11-52). You can go as low as 10 gauge on acoustic, but in general I find 10’s a little too light for most acoustics, and the guitar will need some tweaking to play right with those strings. The number refers to the thickness of the string. ’12’ = 0.012mm. The Ibanez headstock pictured (far left) is typical of steel string guitars. The slotted headstock (left) is less common. 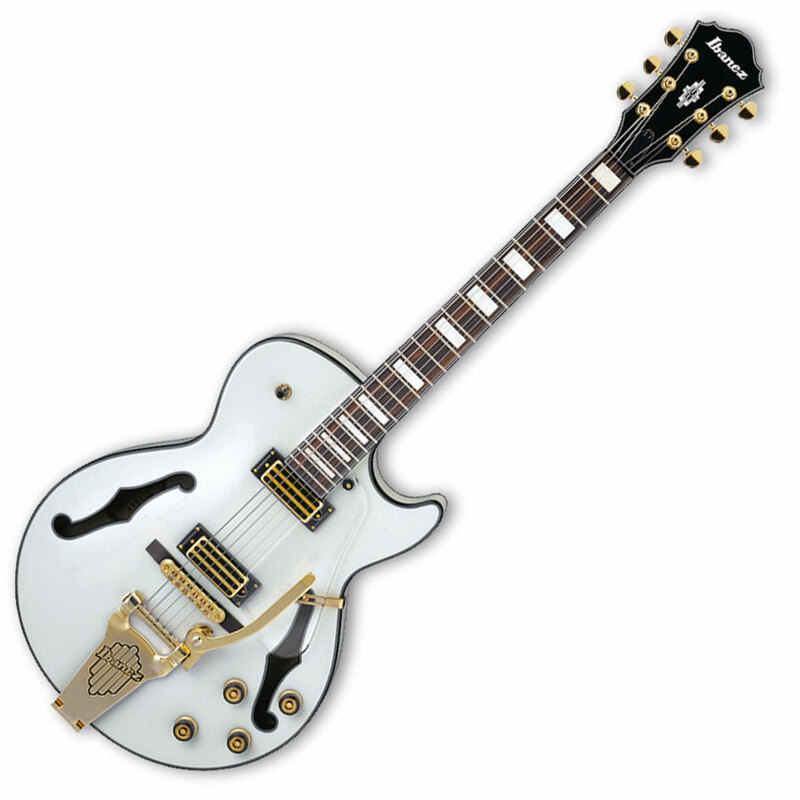 Electric guitar strings are usually nickel wound, and come in a huge range of gauges. Again, ignore the names. ‘Medium’ is not really medium. The most common gauge for electric strings is 10-46 (10’s), although 9-42 (9’s) are quite common also. Ernie Ball makes the whole ‘name’ thing easier by calling 10’s ‘Regular’, but unfortunately most other companies don’t. Electric guitar strings go as low as 8’s, and as high as 12’s typically. Stevie Ray Vaughan reportedly used 13’s, which is really heavy for an electric guitar. This is said to be one of the reasons for his big tone (and bleeding fingers). There are quite a few custom gauges available as well, such as “skinny tops, heavy bottoms” and other hybrid gauges. Again, lighter strings (9’s and down) are easier to play, heavier strings (11’s and up) have a fuller, ‘fatter’ sound. If you’re changing gauge your guitar will probably need adjusting slightly, especially if you have a tremolo (whammy bar). Single Strings: We sell strings singly (in store only), you don’t HAVE to buy a set, although often when your string breaks it can be an indicator they’re all getting a bit old and a replacement set might be in order. I replace my strings quite regularly, perhaps once every couple of months. It all depends on how often you play, how much you sweat, how acidic your hands are, the quality of the strings, and how fussy you are about the sound, because older strings sound dull and lifeless compared to new strings. The main thing we’d love you to know about single strings is this: The TOP string is the highest pitched note, or the skinniest string. It’s NOT the bottom because it’s closest to the floor. This is why if you come in and ask for the ‘bottom E’ we’ll always check if you mean the fat one or the skinny one. Because the bottom one is the top one….er, the fat one. Whew. Of course that’s not EVERYTHING you could possibly know about guitar strings. Within all these types of string there are various brands, better quality, coated for longer life, etc etc. This is just the basics, but I hope it helps! Remember we can put them on for you in store too. PS: THIS is a semi-acoustic guitar! 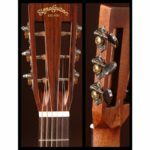 This entry was posted in Advice, Articles, Guitar, Shop, Strings. Bookmark the permalink. Which strings are best for a telecaster for blues..
Hi, the only correct answer to both these questions is: Electric Guitar Strings. Brand and gauge is a personal decision that is completely up to the individual. My personal preference is for slightly heavier strings on single-coil guitars, at least 10 gauge (I personally usually use 11-48’s), as I feel 9’s sound a bit weak on Strats especially. This goes double for blues. However Mark Knopfler uses 9’s on a Strat and he sounds pretty decent! I personally use Ernie Balls, but most electric strings are made the same way and there’s not a huge ‘night and day’ difference between most major brands, in my opinion. If I couldn’t get Ernie Balls I would happily use another brand as long as the gauge was the same.